I had fun with acrylic ink drips today. I dropped them on wet paper. The first one was a red splash that made a sunburst (if the sun were that color). The other inks were metallic; I didn’t form any pattern consciously. The ‘sun’ inspired a horizon line. In keeping with the iridescent nature of the inks, I used my watercolors with pigments infused with fine mica, to imitate the sheen of metal. The result is below, my Alien Landscape, complete with blobby life forms. 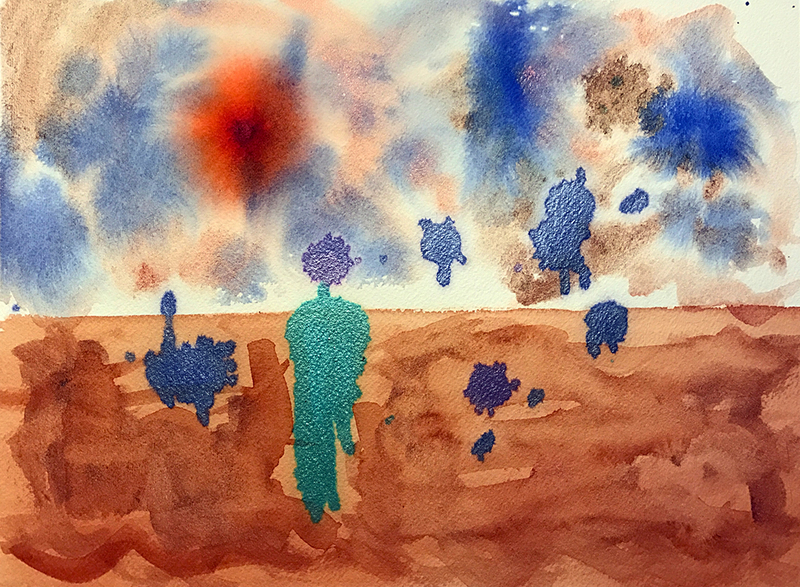 This entry was posted in Personal Stories and tagged abstract art, abstract expressionism, aliens, art, artistic process, creative process, creativity, painting, visual arts, watercolor. Bookmark the permalink.